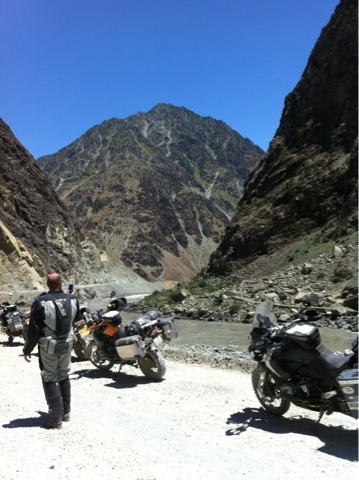 A delayed start from Kalaikhum to allow a visit to the Afghan Market and then onto the toughest roads so far. Winding up the valley trying to avoid the mountain on one side, the river on the other, stray rocks and trucks in the road took a lot of concentration. From time to time remembering to look up and appreciate the amazing towering mountains above you. After four hours and only half way into the trip it was starting to feel hard. Just then the road turned east and the river opened out into a long thin lake with fields on either side. The road straightened and smoothed, speeds picked up and the jarring stopped. In no time we were in Khorog, the capital of the Pamirs. 235km of hard riding. We've made it!